The cats are up in the shop! 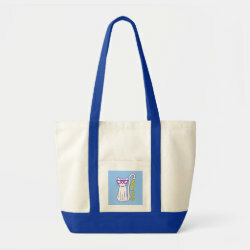 Besides having fun with the kids, I've also been working on new designs for my shop. 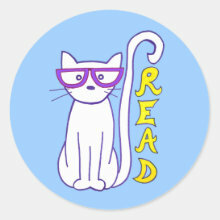 You got to have a sneak peak at my most recent design in my last blog post: a funky cat with glasses encouraging everyone to read through a dangling sign hanging from its tail! I ended up creating products with two color versions of this design. A white cat on blue background and a light blue cat on lavender background. 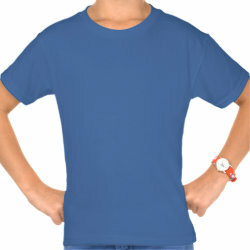 As always, you can easily customize the background color. 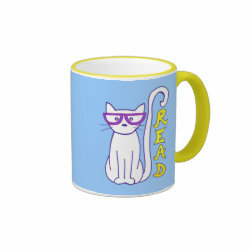 I want to share a selection of products with you that would make wonderful gifts for librarians or any book lovers. Also, if you are looking for a gift to thank your kids' teachers at the end of the school year, many of these items would make fun, unique gifts. No worries that another parent gave the teacher the same gift! Any books that make great summer reads, either for kids or adults, that you can recommend? Always love to read your comments! P.S. To thank you for checking out my new designs, please use code STICKERS4YOU through 6/30/2014 11:59PM (PT) to receive a 20% discount off any stickers in my shop! Feel free to share if you know someone who loves stickers - and who doesn't?! What I have been working on: a New “Favorites” Section! Always working on something, trying to make things better…. that’s me! Sometimes it works, sometimes it doesn’t but hey, including more of a good thing can’t be bad, right? That’s why I decided to include the designs of some very talented, creative artists. Designs I really love. You may have already noticed that I added a new page to my website called “favorites.” I so often find attractive designs that catch my eye, created by fellow artists. I decided to dedicate a page to these wonderful finds so that you have an even greater selection of high quality gifts to choose from. I’m hoping that you like these designs as much as I do and that this selection of items will help you in your shopping for that special person in your life. All the items on the “favorites” page will be kid friendly, G-rated and suitable for even the youngest in your family, just like the designs I create. I will be updating my “favorites” from time to time so please check back. As always, I welcome your feedback! Please don’t hesitate to leave me a comment if you have a question, like the “favorites” selection or just want to say hi! I’m proud to say I completed all 30 days of the #tinkersketch sketchbook challenge in April! Wahoo! This challenge was just what I needed. See, as you may have read in my earlier posts, I experienced some health issues this past fall and winter that caused my busy life to come to a halt and made me reflect on what I truly need to focus on. Throughout these past few months, I have become better at saying “no" (which has been so hard for me) and committing to make two things a priority: physical therapy for my body and creating art for my mind. that during the process, my confidence would increase by pushing me outside of my comfort zone and trying out new or forgotten media. So much so, that I just created a small watercolor painting as a birthday gift for a friend which was received very positively. Before the challenge, I hadn’t worked in watercolor for years and there is no way I would have even thought of creating the painting as a gift, let alone in watercolor! I would definitely encourage you to take on a daily sketchbook challenge when the opportunity arises and be surprised with what you will learn! Have you participated in a sketchbook challenge before? Do you practice daily art journaling? Please share about your experience, what you have learned from the process and what helps you stay committed.